Let’s get down to brass tacks: the basic strategy of roulette is to win. But how do you get to that seemingly elusive state of triumph and a fat wallet? How do you win? What’s the easiest way? 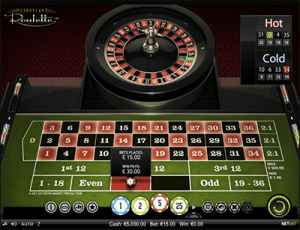 What are roueltte betting strategies? This, of course, is rubbish. 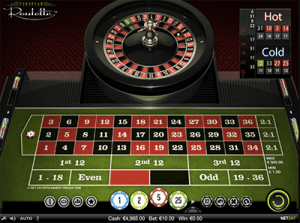 Like all gambling – aside from card counting in Blackjack – there is no miraculous system to improve your chances of winning. Theoretical calculus of probability and all of that sort of mathematical voodoo is all well and good, but that nonsense works in theory and isn’t a recipe for success but just a way to keep your head above water. There is an old saying: Communism works in theory too. But here are a couple of simple strategies and methods you could try next time you get the itch for a spin or two. A lot of people out there have clued on to this little gem where you place a bet on two of the three dozens (an outside bet that pays 2:1), or in the same vain, bet two of the three columns (an outside bet, situated at the foot of the table that also pays 2:1). Either route you take (columns or dozens) essentially has you covering two thirds of the table. For example, betting $15 on two dozens (or columns) at $30 total. Assume you win one dozen. You will lose $15 when the table is cleared but you will receive $30 on the winning $15 dozen bet, giving you a grand total of $45: a $15 profit for the spin. Obviously the downside of this bet is not hitting one of your two dozens and losing it all. Or, like all outside bets, “0” being spun up and losing all outside bets. Martingale is a bit of an odd little strategy and can only be genuinely applied to even money bets: red or black, odd or even and 1-18 or 19-36. The theory goes that you double up your losing bet because in a 50-50 punt, what you are betting on is bound to come up sooner or later, right? For example, wagering an $50 bet on red loses. Next hand I would bet $100, which covers my loss of the initial $50 and grants a nice profit of $50. However, if you were to lose the second bet at $100, the next round you would bet $200, which covers the last two losing bets totaling $150 plus an $50 profit. The only down side to the Martingale Strategy is that it is possible to outlay a grand or so just to make a $50 profit, or be prevented from attempting to bet back your losses when a table’s maximum limit is enforced. This strategy is more readily applied to Live Dealer online roulette or bricks and mortar roulette because it all hinges on the dealer’s spinning ability. Sometimes when a dealer isn’t concentrating on their spin and ball action they tend to spin in a rut, spinning the wheel and the ball the same speed every spin. This can result in section spinning. For example, if you notice 28, 12, 35, 3, 26, 0, 32, 15, 19, 4, 21, or 2 coming up, then the dealer is section spinning around the “0”, so you would load up on these numbers, hoping the dealer continues spinning in much the same manner. You have to be very alert to what numbers are being spun up to be able to exploit this system and you must be quick to alter your betting if the dealer loses the section they have been spinning. This is a simple one. Just stick with your favourite numbers and hope for the best. There is nothing worse than slaving away at one system or another and then sitting by idly and watching your favourite numbers come up time after time and kicking yourself for not betting them. 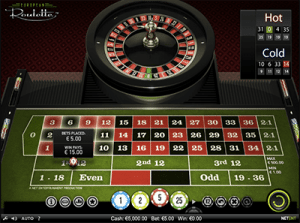 These Internet casino sites all offer online roulette options like Live Dealer roulette, American roulette and European roulette. Each site has a special sign up bonus, too. G’Day Casino offers you an unlimited deposit match bonus. Guts Casino offers up to a $500 welcome bonus and 100 free games. All Slots Casino offers up to $1600 in new player casino bonuses. Casino-Mate offers up to $1400 in new player casino bonuses. Each site has their preferred methods to deposit and withdraw funds. Check the site for details. We have only scratched the surface of theories for playing roulette, but hopefully this will get you started. So while roulette is a game of lucky it can be fun to get out there and apply some of the above strategies to your next game.